Graphite pump can be withstands the most corrosive media (hydrochloric acid, chlorine compounds, sulfuric acid, phosphoric acid) at operating temperatures of up to 200°C. Its corrosion resistance is unlimited even in the most corrosive media and high temperature, which have exceed the application limits of plastic pumps (PP, PEHD, PVDF, PTFE, PFA). 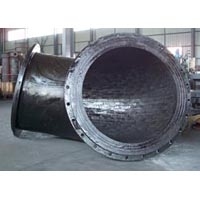 - Graphite and graphite lined pipe & fitting: used in ducting chemical corrosive liquid & gas such as HCl, HCl gas etc.